If you mean, "Is this part of the (so-called) Cthulhu Mythos? ", the answer is "yes"; it is one of the major tales in that group. If you mean, does it feature Cthulhu him/her/itself, then only glancingly, via a mention of "the Cthulhu-spawn" concept. That said, I will also add that it is certainly among Lovecraft's greatest works; second only, I'd say, to "The Colour Out of Space" or "The Shadow Out of Time"... and maybe not even that. My only caveat would be that this novel has, throughout the majority of its history, been badly botched textually, with various editorial alterations, as well as chunks of text missing. This has been rectified in the majority of modern editions by reference to the text established by S. T. Joshi in the mid-1980s, but whether or not this version relies on that, or on earlier (and therefore corrupt) texts, I do not know. It would seem to be taken from the original Astounding serial (though I can't, of course, verify that). Is that outside the majority of its history or was it already corrupt? Of course, that begs the question of whether the ebook corrupts the serial. Even if the serial is not equal to Lovecraft's draft, fidelity to the way it first made its bang in the world would count for something with me. Well I shall download it for my Sony reader and see what all the fuss is about! It's one of my favourite Lovecraft stories, certainly my favourite of his three novel length tales. I've been wondering about dipping my toe into the esteemed Lovecraft, so maybe I'll use this one as an intro! As much as I like this one, I'm not sure it's the best place to start for an intro. I would start with something shorter like "Shadow Over Innsmouth" or "Rats in the Walls". Well Ive read the collection Dagon and enjoyed the story The Shunned House. Now that is a good story! I agree, that's one of my favourites too. Not mentioned as much as some of the others but deserves to be. No, that is the most corrupt version ever. Good Lord, why? HPL went so far as to consider the novel "unpublished" after seeing the AS text, and judging from descriptions in his letters and in I Am Providence, it was edited into cretinous incomprehensibility in places. A departure? I thought Chthulu was typical Lovecraft! I understand your feeling about that. No doubt some Astounding readers had read and liked stories by HPL, but I should think that many would not have read him before, associating him with the supernatural pulp of Weird Tales, which I suspect had a low-class reputation. And then here is this story with something of the quality of Olaf Stapledon's vistas of vast ages and great distances. Well, maybe if it's as bad as all that, it would defeat the purpose but Extollager gets what I was going for. If the story came out and disappeared and only got widely read in a later, different version, then fine but I'm not always impressed with the "genuine revised edition that's the text for real this time after those other four genuine revised editions!" concept and would like to read whatever happened to actually enter historical consciousness in the first place. IOW, I don't think there can only be one good edition and that it has to be a particular kind. Sometimes it's the author's original manuscript, sometimes the first magazine publication, sometimes the first book publication, sometimes it is a revised edition. It depends. I don't know if it was considered low-class by Astounding readers - and we always have to remember 1936 Astounding wasn't at the peak of its literary powers or scientific credibility, either (not bad, getting closer, still probably the premier SF magazine of the time, but not all there) - but Lovecraft was probably considered - heh - The Outsider. Hamilton, Kuttner/Moore and other published in both (usually at different times with different material) but large parts of the audiences/authors probably didn't overlap. Ah - the letters columns are always great for inflammatory commentary. J-Sun: the difference is considerable, albeit in ways which are not likely to be recognized by casual or hasty reading. 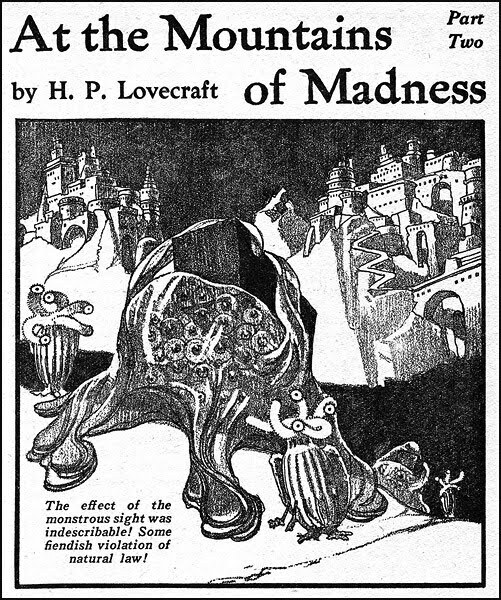 Having first encountered this tale via the Arkham House edition (which incorporated various corrections of the Astounding text made by HPL in his copies of the magazine, as I recall), I can say that at least that earlier edition is worth reading... but it is a far cry from the much subtler, richer novel which Lovecraft originally wrote. The restored text really is a much better, and more rewarding, reading experience. As for the Astounding text... as I pointed out in another thread, there are some substantial bits of text missing, which completely alter the way the story is read at various points (as well as sometimes making HPL sound half-literate). That edition actually contains literally hundreds of errors, alterations, and deletions -- a rather major difference by any standard. Just so there's no misunderstanding -- I'd want to read the restored text; but I think the defective Astounding text is of interest for the history of science fiction and sf fandom. This serial must have made quite an impression on Astounding's readers, and I suppose that was the only text of the story that was available for many years, aside from an Arkham House version; but Arkham House books then were limited editions and probably beyond the financial resources of some young readers. j.d. : thanks for the detail on the differences. Could one of you guys advise on how to determine what version of this book you might be buying. I've taken a quick browse in Amazon and I can find no reference to the origins of any of the editions for sale there. I don't have my source at hand, but I believe that Ashley said that "Yank" pulp magazines traveled to Britain as ballast (?) in ships, and were sold as "interesting reading" at low prices in Woolworth's stores. Clarke and other members of the British SF community may sometimes have had subscriptions, but I suppose that, in many cases, British fans got their hands on these magazines in a catch-as-catch-can fashion. Can you imagine?? I find it delightful, in a way, that sf pulps got to Britain in a way like Dracula's rats!! 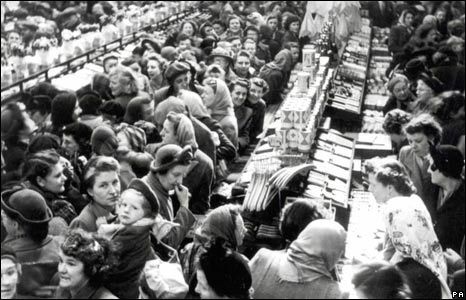 Here are shoppers at a Woolworths in the 1930s. Look closely and maybe you'll see the Lovecraft Astoundings! Let's go in and see if there are any new issues! Most of the recent editions are using the restored text, but some of the major American publishers (such as Ballantine/Del Rey, etc.) are still using the older corrupt Arkham House texts. As far as this specific story, you can get the restored text in the Penguin Lovecraft book The Thing on the Doorstep, the Barnes & Noble Complete Fiction (the best bargain, by the way, as it does contain all his original fiction, for a remarkably low price, and in a very attractive and sturdy hardbound copy), the Arkham House editions post-mid-1980s, and the Modern Library edition of At the Mountains of Madness: The Definitive Edition (which comes with his essay, "Supernatural Horror in Literature, and a very insightful essay by China Mieville, as well as an index to SHiL and a chronology of HPL's fiction).